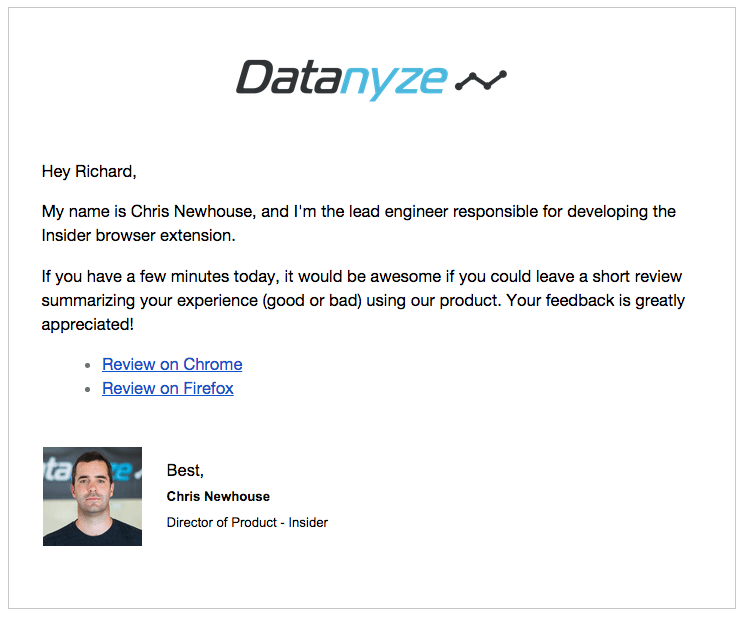 Back in January of this year, we launched a free Chrome extension (Datanyze Insider) targeted for sales and marketing pros. Over the course of this post, I do my best to outline and explain the tactics that got us to 10,000 installs in 6 months. If you’re thinking: “Great, but I don’t have a Chrome extension” — don’t sweat it. These tactics are highly translatable and can be used to launch and grow any new product or offering. For the skeptics, here’s a snapshot of our month-by-month progress. We launched Insider on January 21st and hit 10,000 users by early July. By July 21st, we were almost to 11,000 free users. Each of these deliverables has been absolutely crucial to the success of the campaign. While driving traffic and acquiring new users may seem like the most crucial element, I cannot stress enough how important it is to make sure your first users love the product and are willing to spread it around. Let’s dig in. Where do our potential users live? How do they look for new tools? Whose opinion do they trust? Starting out, we did a bit of research to decide which blogs to approach. 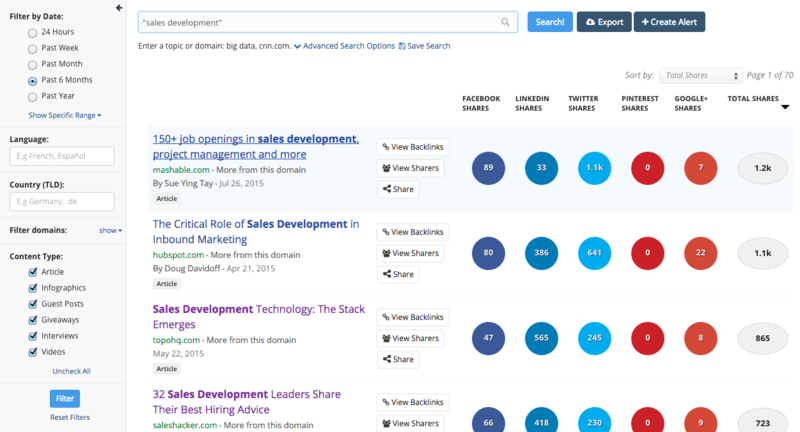 We used a combination of BuzzSumo and Moz for this. With BuzzSumo, you can enter in any keyword phrase, author or URL, and it will send back the most shared articles for that search term. You can filter results to identify which topics are trending this month and you can even view who’s sharing each article on Twitter. In the search results, Moz will provide the domain authority for each page and the number of websites that link to it. We focused on the results with a high domain authority and lots of inbound links. Once we had a nice sized list of blogs we wanted to post on, it was time to start reaching out. Kissmetrics contributor, Kristi Hines, wrote an awesome post on how to do this, so I won’t try to reinvent the wheel. However, I will offer up one piece of advice: BE AUTHENTIC. When you’re reaching out to someone for the first time, you need to find a way to quickly humanize yourself to your recipient. This means doing a bit of research on the blog if you’re reaching out through a Contact Us page or the author if you’re reaching out directly. Remember, if you want to get value, you’ve got to provide it first. Put simply, influencers are industry experts that your buyers trust. When they tweet, buyers retweet. When they blog, buyers share. When they speak, buyers listen. Identifying and engaging with influencers correctly was a key piece of our acquisition strategy. First off, we set out to identify the main influencers in our space. A great free tool for doing this is Topsy. 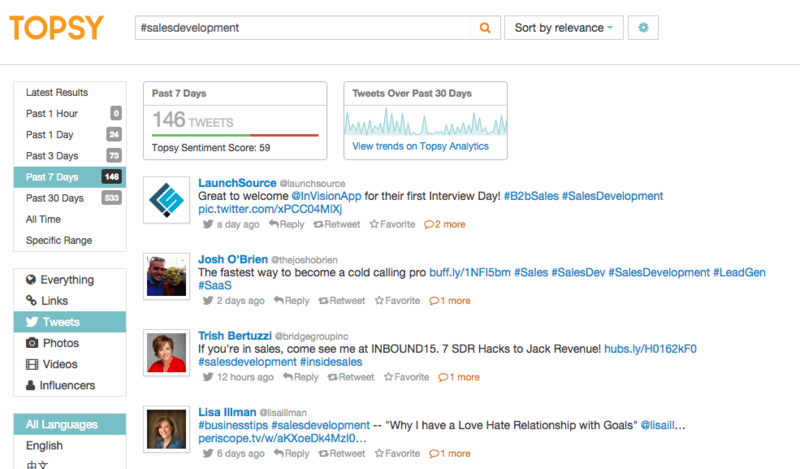 It helps find out who’s driving your preferred topic of conversation on Twitter by keyword or hashtag. You can sort results by timeframe or use the “Influencers” tab to check out which handles get retweeted the most on a given topic. 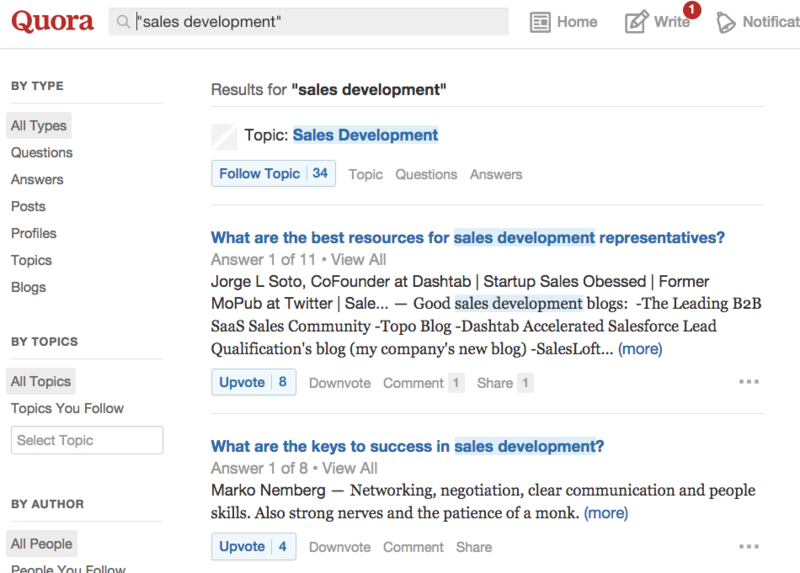 Another great way to find influencers is on Quora. 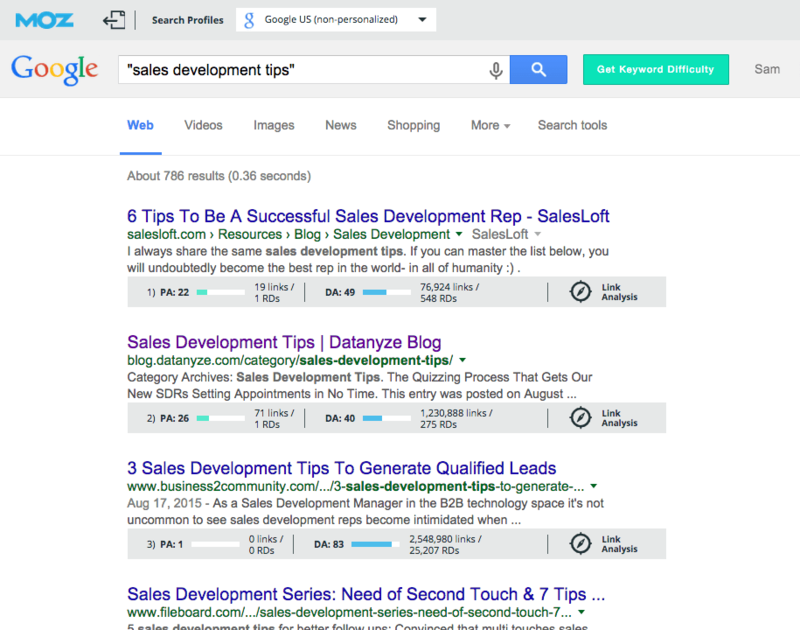 A quick search for the topic “sales development” brings up a number of frequently asked questions and a preview of which responses received the most upvotes. Interact with each influencer on social. Retweet their posts on Twitter, follow their answers on Quora, comment on a blog post they wrote and, if possible, mention them in your own blog post. Connect on LinkedIn. Before reaching out, connect with each influencer on LinkedIn. This helps humanize your outreach by putting a face to your name when the time comes. Ask for advice. When it comes time to reach out, don’t ask them to share or write about your product right off the bat. Instead, ask for advice. Influencers love digging into new tools and sharing their expertise. Take their advice. If you’re able to get some feedback on your product, make sure you take the necessary steps on your end to incorporate their advice into a V2 of the product. Show them V2 and ask for help. Once you’ve got something new to show them, write your influencer back and note the changes you made. This will show them that you’ve invested in their feedback, making them more likely to become invested in your product. Then (and only then) should you ask for their help with promotion. Remember that install spike in June? It came from an influencer blog post. Quora is an absolute treasure trove when it comes to new users. 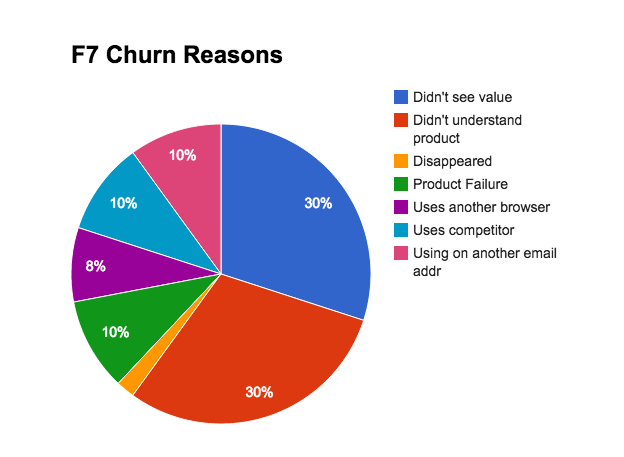 Thousands of new questions get asked, answered, and upvoted everyday, and top answers often hit the top result on Google (and stay there). 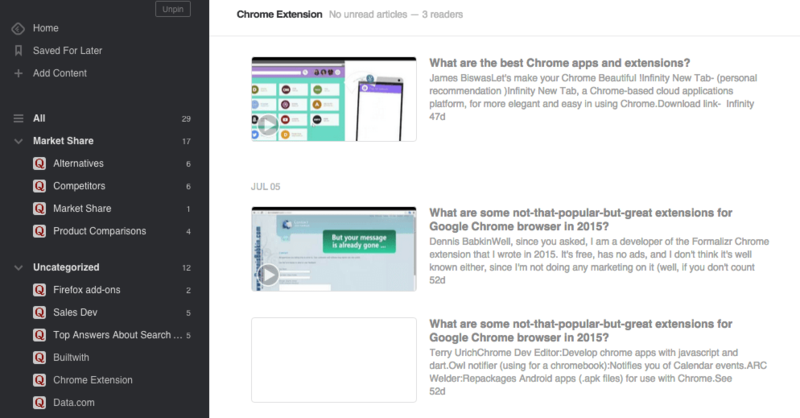 To keep up with questions on Quora, we used a free tool called Feedly. With Feedly, you can copy any topic URL from Quora and create an RSS feed that will alert when new questions are asked. Here’s an example of a feed we used that covers Chrome extensions. Check this out if need help setting it up. Addressing our prospect’s question in full. Providing more than just a link to our product. Organizing our answers with helpful pictures and bullets. Furthering the discussion by commenting on or citing other helpful answers in the thread. Once we answered each question thoroughly without being too product pitchy, we chose to ask some co-workers for a little upvote love. This helped get our answers higher in the thread and generate more views. Make them confident enough in our extension to fill out a form and install something on their computer. Help them find success quickly so they are comfortable recommending the extension to their network. Pick out several power users and ask for a review in exchange for more credits. After a good amount of back and forth, we decided to take a risk. Our plan was to add an email to our existing nurture track that simply asked for a review. It comes from the engineer who created the extension. It puts a face to the name. It asks for both positive AND negative reviews. Putting ourselves up for both positive and negative reviews was, admittedly, a huge risk. But it was one we were willing to take, because we were confident enough in our product and onboarding flow that users would be successful enough to react favorably. “How can we make our first users successful without being too hands-on?” was a question we started to ask ourselves as the installs rolled in. First things first, we decided to spend a little money. We needed a how-to video that could quickly explain the value of using the extension without digging too deep into the features. We did a bit of research and wound up using SmartShoot, an Elance of sorts for outsourced video production. The video doesn’t exactly bring you to the edge of your seat (we’re no Slack or HubSpot) but it does get the point across. Next, we created a help center focused on providing answers to questions new users might have. We covered all the basics from install to account creation, and also provided video tutorials on how to use the most prominent features. We then rolled these two assets up into a welcome email, keeping things simple and brief. You’ll notice that there are quite a few links in there, which may lead to sensory overload for some users. However, we tested a variety of different email styles and found that users who received all resources in the first email, performed nearly 25% more actions in the first week. For us, this was a HUGE piece of knowledge. After the initial onboarding email, we continued with a 6-email nurture track that focuses on tips and best practices. We figured that if users were successful with the extension, then they would be more likely to refer their friends – a topic I’ll discuss in the following section. Many readers may be familiar with HubSpot’s Chrome extension, Sidekick, which was launched back at the end of 2014. One of the most fascinating articles I’ve read (and one that should be on every data-driven marketer’s short list), is a post that outlines their growth approach for this product. We are currently taking a similar approach, but aren’t getting quite as in the weeds as HubSpot did (…bootstrapped, remember?). Currently, we’re focused on increasing the number of credit-based actions a user takes. This means identifying the demographics of the users that drop off, figuring out when they drop off, and why. I should mention that we’re still very much in the middle of this process, but if you’re interested in our preliminary findings, feel free to shoot me an email! Nothing spreads faster than a free tool people enjoy using. In our quest to drive more installs, we decided that it was worth using what little design and engineering resources we had to get something off the ground. Building a successful referral program is no easy task, but luckily there are plenty of awesome examples out there to help get the creative juices flowing. In particular, we decided to emulate Dropbox’s referral campaign, which was a key ingredient in their whopping 3900% growth. Here’s a look at our referral page. …I’m not a big fan of the confetti either. We highlighted a target goal of “500 credits” to give users something to work towards. We chose to make Invite Gmail Contacts the focal point. This is the holy grail of referrals, but not always the first one on a user’s mind. We provided a shortened URL for users who prefer not to share on social. Some of our most viral sign-up chains came from links copied to an internal chat tool like Slack or HipChat. 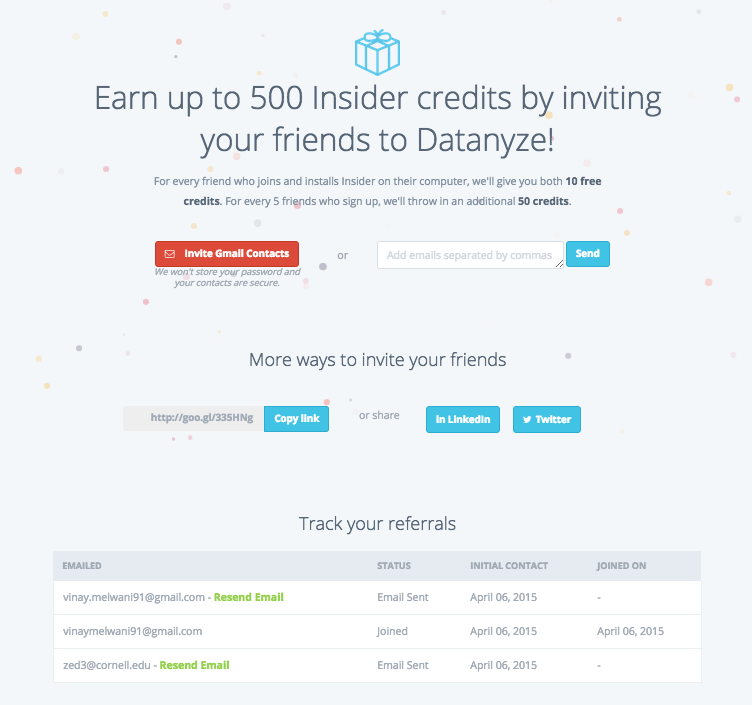 We gave users the ability to track their referrals and even resend the referral email to prompt friends to sign up. We gave both the referrer AND the referee 10 additional credits as a reward for signing up. Since implementing the program back in March, referrals have accounted for nearly 25% of all new installs. It has also helped our sales team identify which accounts are most likely to convert based on the number of active users on the same domain. So there you have it — a little over 10,000 installs in 6 months! Perhaps not all of this advice is uniquely relevant, but hopefully there are a few nuggets in there that you can take away. Would also love to hear about any bootstrapped marketing tactics you’ve used to supercharge a marketing campaign and get results. About the Author: Sam Laber is the director of marketing at Datanyze, the all-in-one sales intelligence platform. 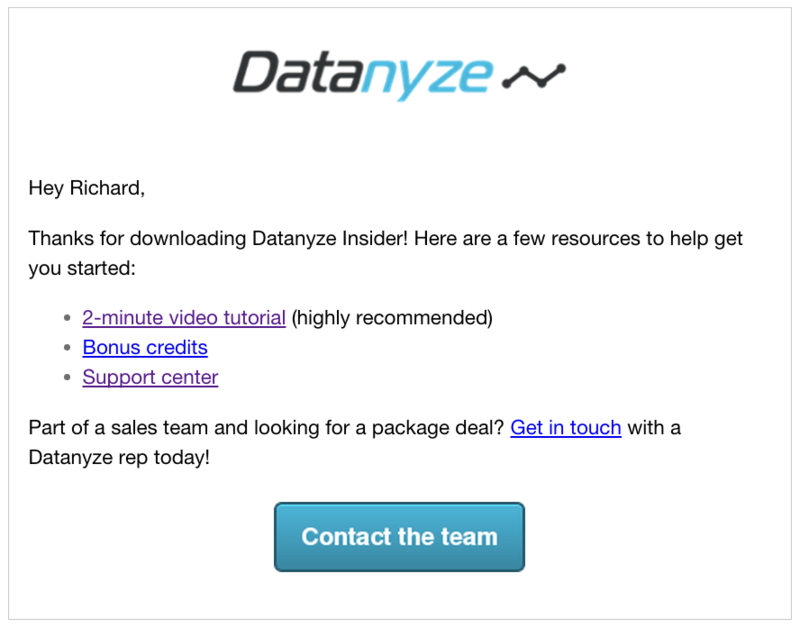 For more content, check out the Datanyze blog or follow Sam on Twitter @SLaber89.